Here’s a very delicious platter of Chole (Chickpeas Curry) and Bhature (Indian deep-fried and puffed bread made with plain/refined flour) for you all this Friday! It is a very popular North Indian delicacy which you will find in the menus of most of the North Indian restaurants. 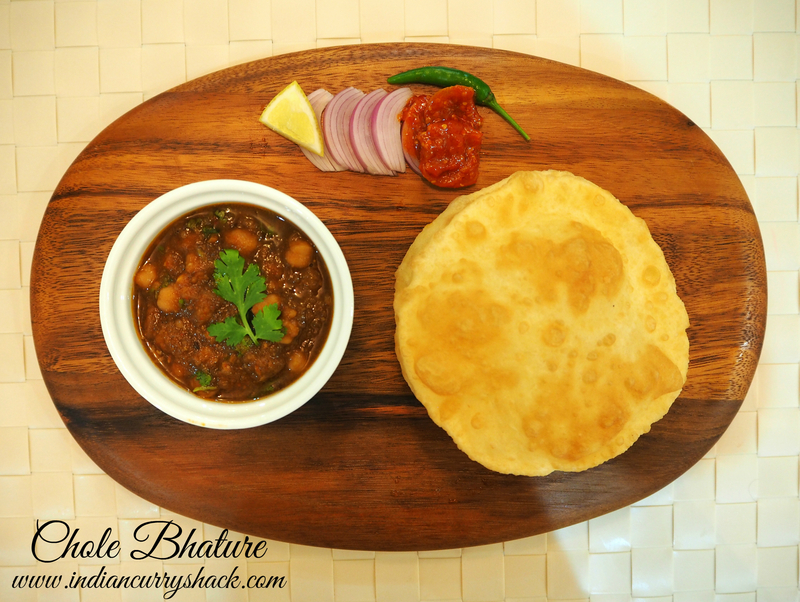 It is a favourite combination at home as well and we relish Chole Bhature with lemon pickle and sliced onions. If you haven’t tried this incredible dish yet, then come join us at Fiesta Friday #73 (a party hosted by the very creative Angie from The Novice Gardener) and give it and other delectable dishes a try. This week’s party is co-hosted by Michelle @Giraffes Can Bake and Juju @ cookingwithauntjuju. There’s very few Indian dishes I don’t love, and these look absolutely delicious!!! I love that puffed bread, yum! Thank you very much for your vegetarian recipes. This does sound delicious! The puffed bread looks so good! Oh my, Anugya….. I am drooling over these pics at 545 in the morning.